Sennheiser HDV 820 review | What Hi-Fi? Sennheiser may be best known for its formidable headphones, but it’s also prone to dabbling in electronics - from high-end valve-powered headphone amplifiers to signal transmitters for onstage use. 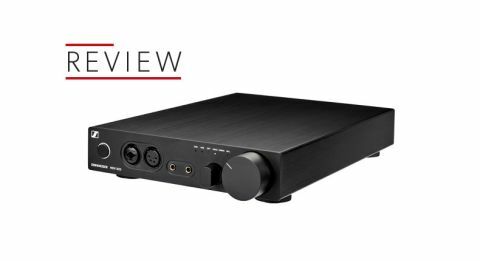 The HDV 820 is the latest version of its desktop DAC, but that description rather understates its range of abilities. Purist hi-fi has traditionally been about having a separate box for each task. It’s done in the name of performance, and it's how you end up with systems with box-counts well into double figures. So to find a digital-to-analogue convertor, headphone amplifier and preamp (with analogue inputs) all wrapped up in such a neat package is a treat. There’s no shortage of connectivity here. On the front panel you’ll find a healthy range of headphone outputs, most of which are a little unusual by domestic hi-fi standards – there’s even a traditional 6.3mm jack integrated into the three-pin XLR socket. There’s also a four-pin XLR and a pair of 4.4mm Pentaconn jacks, both of which allow a balanced connection to suitably wired headphones. Don’t worry about connecting multiple headphones at the same time. This Sennheiser’s headphone amplifier module is a relatively muscular circuit and has no trouble driving more than one pair. Unlike some rivals, there isn’t an obvious degradation of sound when doing so. The HDV 820 can function as a preamp too. Unlike most DAC/preamps, it has both single-ended and balanced analogue inputs and outputs, plus a separate gain adjustment to fine-tune the output for your power amp or active speakers. But let’s not forget the DAC functionality. There are the usual trio of USB, coax and optical digital inputs, and resolution limits of DSD256 and 32bit/384kHz for PCM music files. Inside you’ll find ESS’s Sabre 32 DAC chip doing the number-crunching. We’ve seen and heard this chip in a number of products, and it rarely disappoints. The HDV 820 is nice to use. It feels solid, slick and well finished. The large volume control has a pleasantly smooth action, while the source selector works with a precise clunk. It all gives off the impression of something that will last for years. We would like a display, though. At the moment the unit can indicate the source selected and whether the input signal is DSD or not, but little more. While not a deal-breaker, some indication of sampling rate would be handy - if only to ensure your source is delivering what it should. We start the Sennheiser on desktop duty. Our source is a MacBook (using Pure Music media software) and the headphones are the company’s own HD800S, plus Beyerdynamic's T1. The HD800S come with both balanced and unbalanced leads, and it doesn’t take long to form a preference for the balanced option – the presentation sounds noticeably more dynamic and solid. But regardless of headphones, the results are good. The Sennheiser has a crisp, precise delivery that sounds wonderfully refined. Playing Birth of the Cool by Miles Davis shows off the HDV 820’s ability to organise and interweave different musical strands to form a cohesive whole. It’s revealing enough to show the limitations of the recording, but also insightful enough to demonstrate some of the reasons the album is so revered in the first place. There’s plenty of detail, and it’s rendered in an understated rather than overt manner. The blare of Davis’s trumpet comes through with precision and power, all the while underpinned by fluid dynamics and a smooth, sweet tonality. Switching to Orff’s Carmina Burana reveals the DAC’s impressive way with soundstaging. The stereo image is expansive and stable, positioning the choir and instruments with conviction and stability. There’s a pleasing dose of outright scale too, making it easy to gauge the recording venue’s size. Large dynamic shifts are delivered with composure, the ’820 showing plenty by way of force and power. While the likes of Chord’s Hugo 2 and Benchmark’s DAC3 HGC go further when it comes to dynamic subtlety and transparency, this unit remains an enjoyable listen. It’s when we move to Kanye West’s Yeezus that the ’820 starts to struggle a little. Here, its determinedly refined and sophisticated approach to music works against it. As we listen, we find the aggression and thumping beats of this album are tempered a touch, diluting some of the energy of the music. Make no mistake, there’s plenty of clarity and we have no issue following West’s ramblings or the low-level instrumental strands. It’s a pleasant listen, but those who know the recording know it's not quite what Kanye was aiming for. We rate the HDV 820 as a preamp. Unlike most digital-based products, it doesn’t sacrifice analogue performance to any meaningful degree. We use our resident Naim NDS/555PS streamer as the source and the Sennheiser’s considered approach to music is admirable. It works well driving our Gamut D200i power amp too, which is no mean feat considering the Gamut is over five times the price of this unit and not adverse to highlighting shortcomings in its partners. There’s much to like here. Admire, even. The HDV 820 is well made, nice to use and has an unusually precise and fluid sonic balance. It’s true Chord’s Hugo 2 is even more sonically capable, but it also demands significant trade-offs in usability and connectivity that should be considered when sizing up your new portable number cruncher. Benchmark’s DAC3 HGC is another rival we’d recommend. It too betters the Sennheiser on outright performance, but unlike the Chord offers a similar range of features. But the Benchmark costs a couple of hundred pounds more in the HGC form we tested. So there’s certainly a place for the Sennheiser in this tough market. The HDV 820 may not shout about its talents but that doesn’t mean it can be ignored.